NEW Three key items are now available to purchase in ONE kit… Basic tee, water bottle and notebook for ONE great price! Men's t-shirt in 100% cotton for lasting comfort that gets better with every wash. Traditional cut for casual style. Full-front McGill wordmark with crest screen printed across the chest. Machine washable for easy wear and care. Choose your size and colour. 2-subject notebook contains 200 college ruled sheets. Perforated margins for easy tear removal with clean edges. 11 x 8 7/8 inch sheets with 3 holes fit standard-size binders. Wide edge cardboard dividers make it easy to flip between sections. Divider pockets are reinforced to help prevent tears and offer convenient storage for loose sheets. Wire-bound with quality coil deters snagging. Thick high quality cover stock offers durability and features large golden foil embossed McGill wordmark. Supplier certified by the Sustainable Forestry Initiative. Available in a variety of colours. This ain't your everyday pen. This ain't your everyday pen. 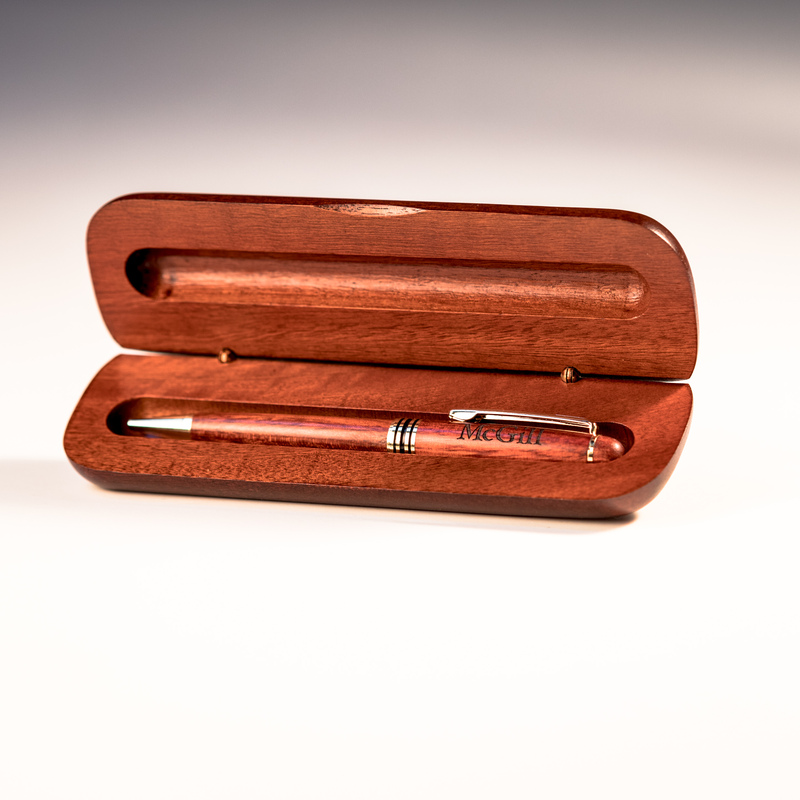 Our McGill pen set features a ballpoint pen carefully placed inside a rosewood box, with a laser-engraved University logo both on the pen and atop the box. Perfect for any gift or special occasion. NEW The ball point pen that underlines achievements. 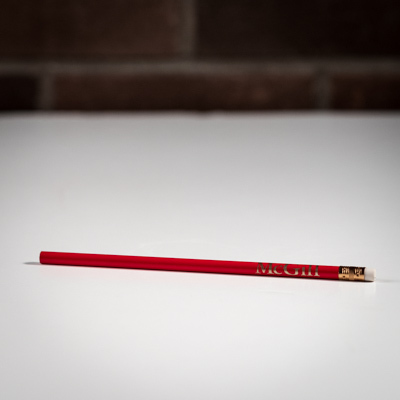 NEW The ball point pen that underlines achievements. 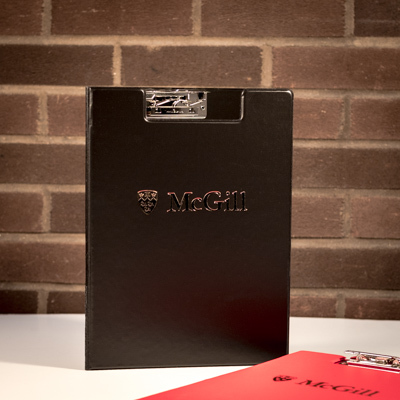 Gold-plated McGill crest is precision-engraved in two-dimensional relief. Lacquered barrel, riveted clasp, and gold coloured accents add to its classic style. High quality ballpoint mechanism and cartridge with quick-drying oil-based ink that is smudge and bleed-proof. Available in black and navy. Take the most eco-friendly notes! 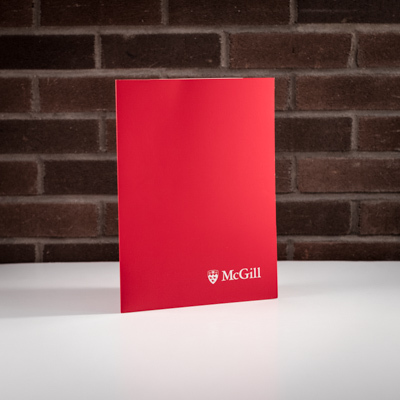 Our McGill 6" x 9" soft-cover notebooks are made with 100% recycled materials here in North America. Take the most eco-friendly notes! 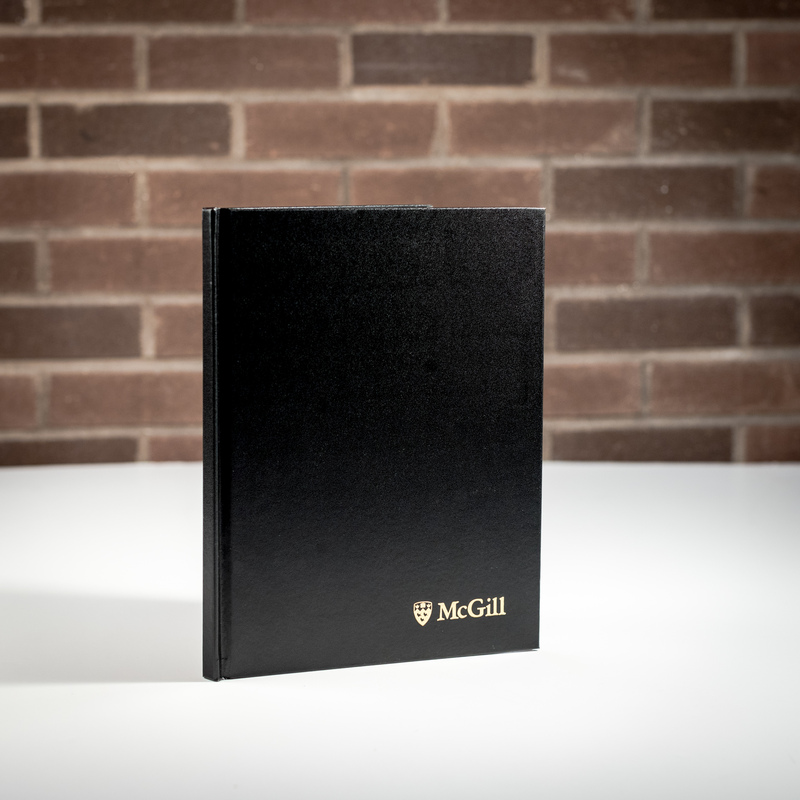 Our McGill 6" x 9" soft-cover notebooks are made with 100% recycled materials here in North America. Each one contains 144 lined, ivory-coloured pages and printed with organic, soy-based inks. 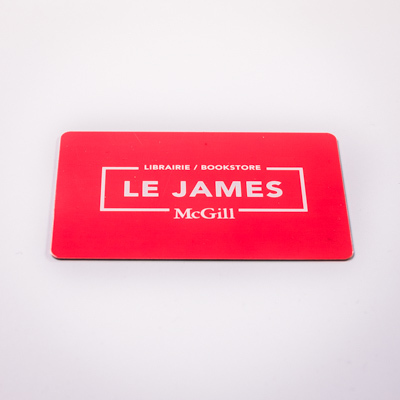 Do the McGill logo proud. Step up your pen game. Step up your pen game. 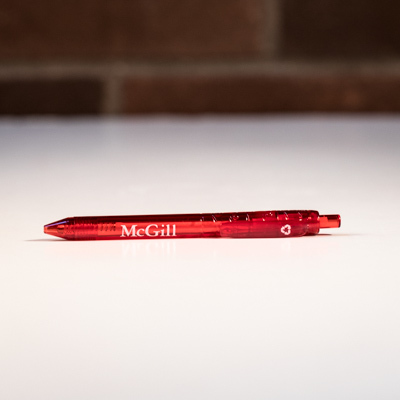 These McGill ballpoint pens feature a matte black barrel, clip and rubber clip, along with a shiny red plunger and a laser-engraved school logo on the side. 3-ring binder for standard loose-leaf pages. Deep clear vinyl pockets on the inside of front and back covers. 3-ring binder for standard loose-leaf pages. Deep clear vinyl pockets on the inside of front and back covers. Brilliant golden McGill wordmark stamped on front cover and spine. Full-width slot on spine for content labelling. Made from durable polypropylene vinyl sealed over rigid board from 100% recycled paper fibers. Easy open-and-close ensures no-hassle access for students on the go. Available in a variety of colours. 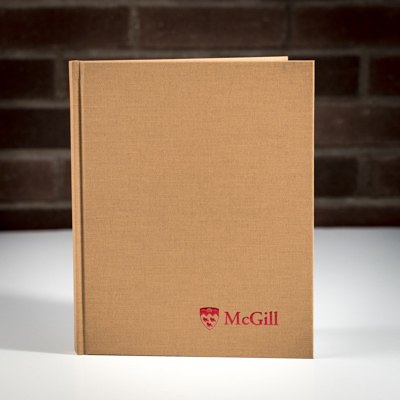 Be inspired to write in this McGill hardcover, sealed notebook with lined pages. 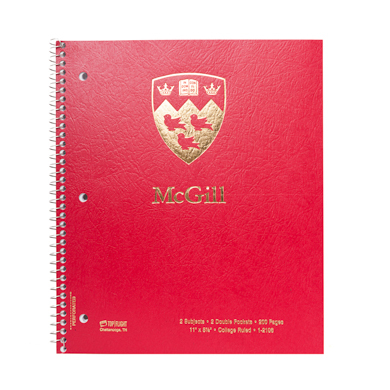 Be inspired to write in this McGill hardcover, sealed notebook with lined pages. 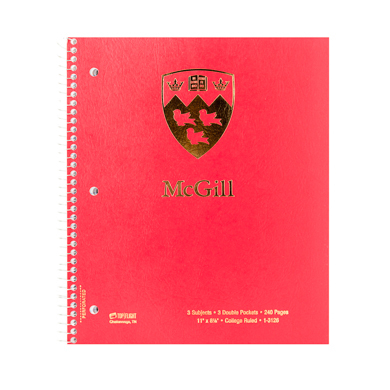 Features a gold McGill crest embossed on the front cover overtop of synthetic leather. Take notes, pen a story, dare to dream. 3-ring binder holds 350 loose-leaf pages. 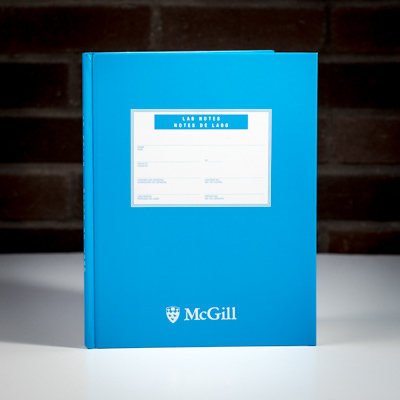 Write to your heart's content in this McGill hardcover, wire-bound notebook with lined pages. 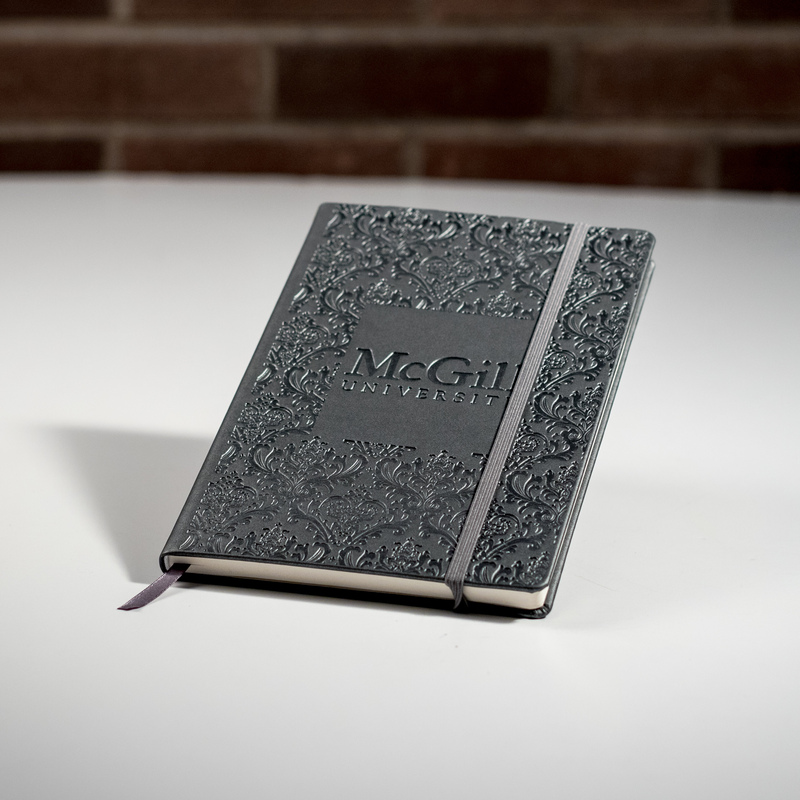 Write to your heart's content in this McGill hardcover, wire-bound notebook with lined pages. Features a half-McGill tartan, half-solid combination colour scheme on the front cover. 1-subject notebook contains 160 college-ruled sheets. Perforated margins for easy tear removal with clean edges. When you reach for a business card, show your true colours. When you reach for a business card, show your true colours. 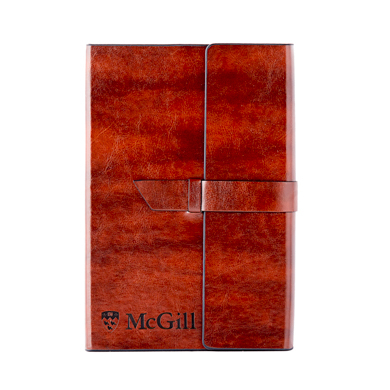 This McGill business card holder features an imitation leather cover embossed with the school's crest, as well as saddle stitching. Stores up to 96 cards. 2-subject notebook contains 200 college ruled sheets. Perforated margins for easy tear removal with clean edges. Represent your school in an environmentally conscious way! Represent your school in an environmentally conscious way! 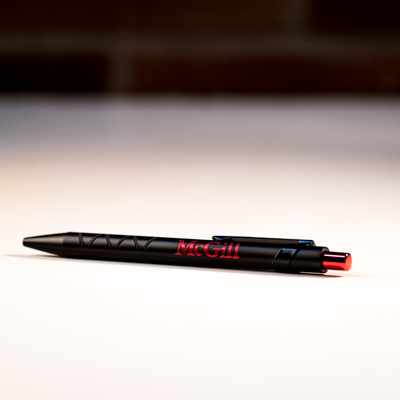 Our McGill ballpoint pens are made with 80% recycled materials from plastic water bottles. 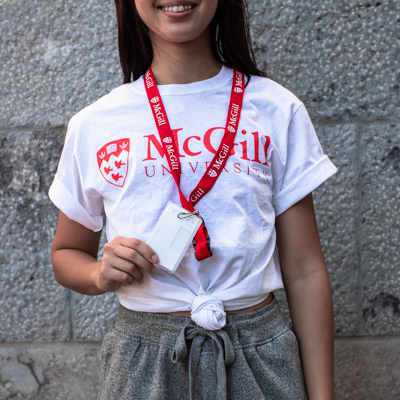 Do the McGill logo proud. 3 subject notebook contains 240 college ruled sheets. Perforated margins for easy tear removal with clean edges. Hard-cover notebook in quality blend vinyl for durability and protection, and quality paper-stock feel. Perfect case binding. Hard-cover notebook in quality blend vinyl for durability and protection, and quality paper-stock feel. Perfect case binding. 192 ruled pages with printed margins and security pattern edges . 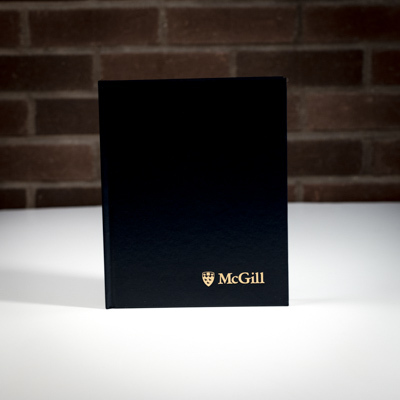 Discreet foil embossed McGill wordmark on the cover adds class to quality. Available in a variety of colours. Hardcover notebook with 200 ruled pages, numbered for practical recording. Hardcover notebook with 200 ruled pages, numbered for practical recording. 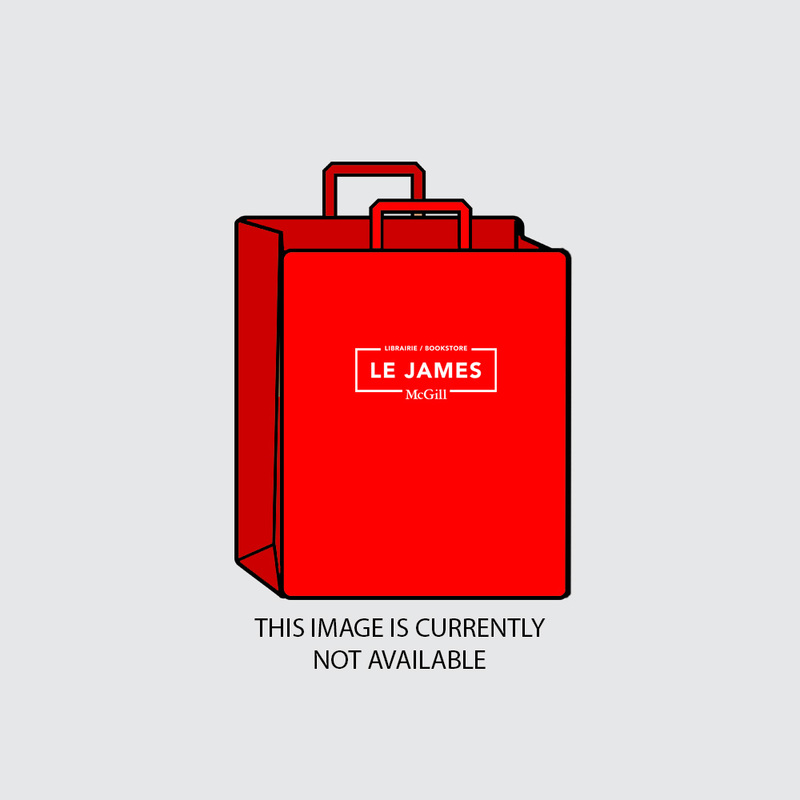 Vinyl cover with paper stock feel and perfect case binding offer durability. Discreet foil embossed McGill wordmark in gold ads class to quality. Quality cardboard covered with flax-weave fabric offers resilience and elegance. Quality cardboard covered with flax-weave fabric offers resilience and elegance. Perfect case binding and sewn sections ensure your composition remains intact. 160 ruled pages printed with margins and security pattern edges. Discreet foil embossed McGill wordmark and crest on the cover adds class to quality. A notebook specific to lab courses. Hard vinyl cover protects contents and provides easy-write labelling. A notebook specific to lab courses. Hard vinyl cover protects contents and provides easy-write labelling. Perfect case binding with sewn sections ensures durability. 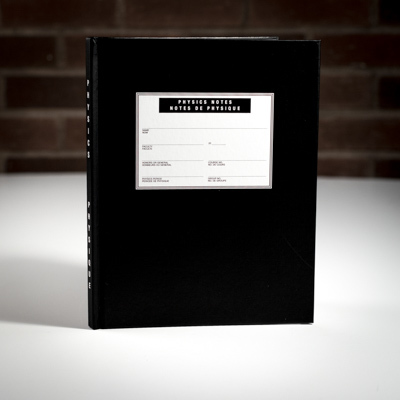 Contains 200 pages, 10 ¼ by 8-inch, each lab-ruled on quality paper stock. Only available in baby blue, and recognized on campus as lab material. 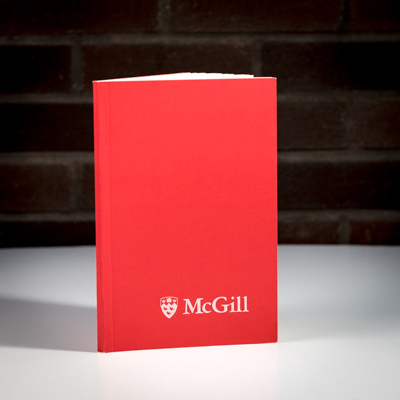 Small McGill wordmark on the cover. Keep all important notes handy and well-protected. Keep all important notes handy and well-protected. 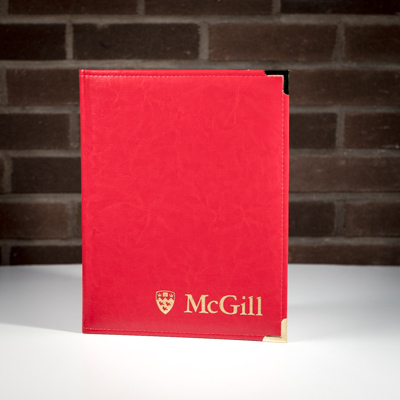 The McGill 8.5" x 11" gold imprint clipboard is made from vinyl, and features both front and back interior covers, as well as a lever clip, to keep all loose documents secure. The essential physics lab notebook. The essential physics lab notebook. 200 pages, printed with graph paper facing a standard writing page, the practical standard for physics lab notes. 10 1/4 by 8-inch sheets, perfect bound and section sewn. Protective hard vinyl cover with defined easy-write label. Available in black. See Lab Book, 200-Page for other lab course. Our certificate holder is so classy, it deserves a certificate of its own. 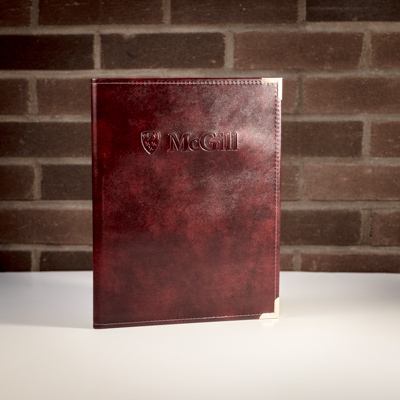 This 8" x 11" hardcover holder features brass corners and a gold McGill imprint on the front. Popular pen with click-button release for easy everyday use. Ballpoint provides smooth ink flow. Popular pen with click-button release for easy everyday use. Ballpoint provides smooth ink flow. Available in two colorful models: red with white detailing and McGill wordmark with crest or the inverse. Take notes in one of our sturdiest notebooks. Take notes in one of our sturdiest notebooks. 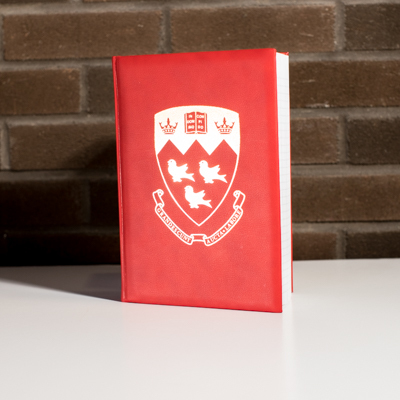 The McGill 5.5" x 8.25" damask hardcover notebook comes filled with 192 ivory-lined pages made with acid-free paper and an embossed damask pattern accompanied by the McGill logo on the front cover. Features a ribbon bookmark and elastic closure. For only the most important details. For only the most important details. Our large, hardcover executive journal (8.5" x 11") comes with 160 pages of lined paper and a gold McGill imprint on the front cover. Classic folder made from Castilian vinyl for a luxurious leather-like look and durable notepad holder. 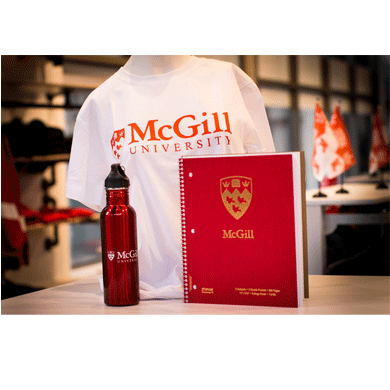 NEW Three essential items for back-to-school 3 Spiral Notebooks, 2 Ballpoint Pens and 2 McGill Pencils, all for $10.00! A4 presentation folder with 2 interior pockets is ideal for presentations, loose sheets and 8 ½ by 11-inch paperwork of all kinds. A4 presentation folder with 2 interior pockets is ideal for presentations, loose sheets and 8 ½ by 11-inch paperwork of all kinds. Glossy finish adds resilience to sturdy cardboard paper stock. 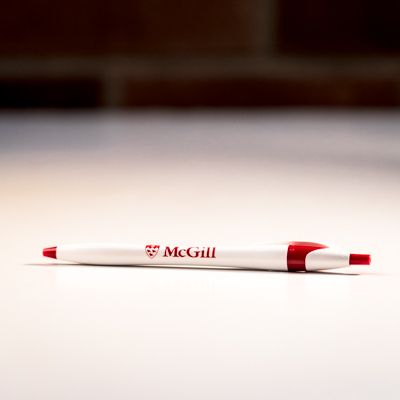 Available in red with white McGill wordmark and crest. NEW Three basic items for back-to-school 1 Spiral Notebooks, 1 Ballpoint Pens and 1 McGill Pencil, all for $5.00! Package of 2 Energizer Max brand AAA batteries (1.5 volt alkaline). Perfect for penlights, remote controls, and clocks.